T.G.I. 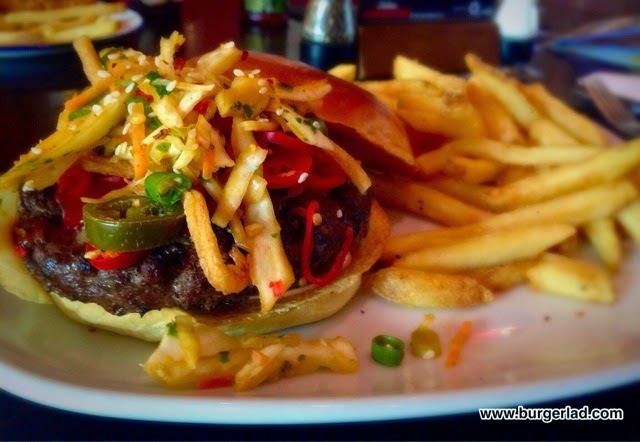 Friday's Bruce Lee Burger - Price, Review, Calories & More! 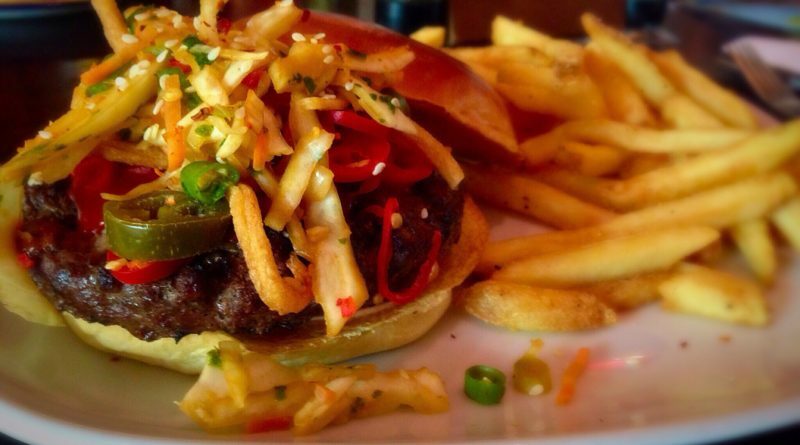 Spicy Asian slaw, crispy noodles, jalapeños, sliced red chilies, toasted sesame seeds, hot Sriracha sauce and chili mayo. Price: £10.99 with crispy fries. 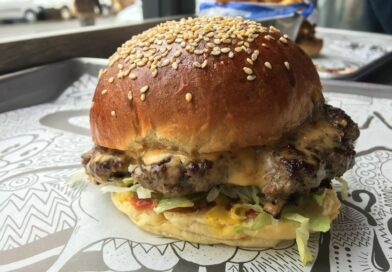 Here I am on my death bed contemplating (a) Suicide (burger) and our PBC, Andrew, now known as Admiral Burgerbar lifted my spirits with a cracking review of the Bruce Lee burger from T.G.I. Fridays. Another day, another burger. 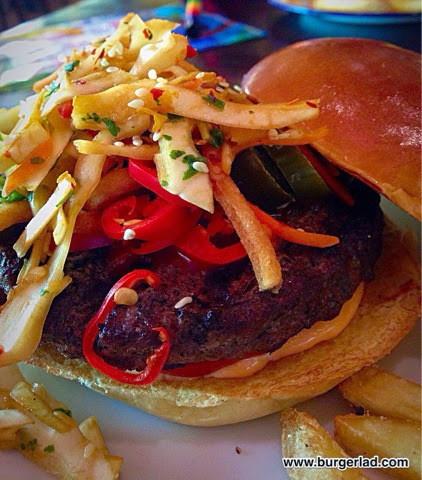 I remember not too long ago, Burger Lad® visited TGI Fridays and had an off-menu item. 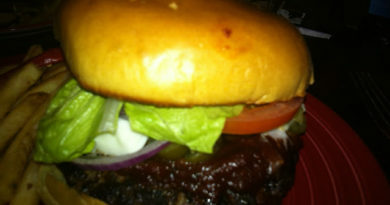 That looked like a good burger, and I remember thinking that a number of the others on their new menu looked good too. So I got on the web and found what had caught my eye the most that time. 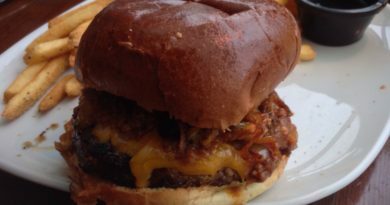 The Bruce Lee burger. Beef, crispy noodles and all manner of Asian spices. Something definitely a little different. What the heck. Let’s give it a go. You’ll see from the picture that it is the crispy noodles that give this it’s very distinctive look. A burger with an 80’s perm. If it weren’t for the spices, this could perhaps be called the Kevin Keegan burger. I must say, it was quite a tough decision. I really liked the sound of the garlic-heavy French Dip burger, and it was Bruce’s perm that clinched it. I’ll have to get the French Dip next time. 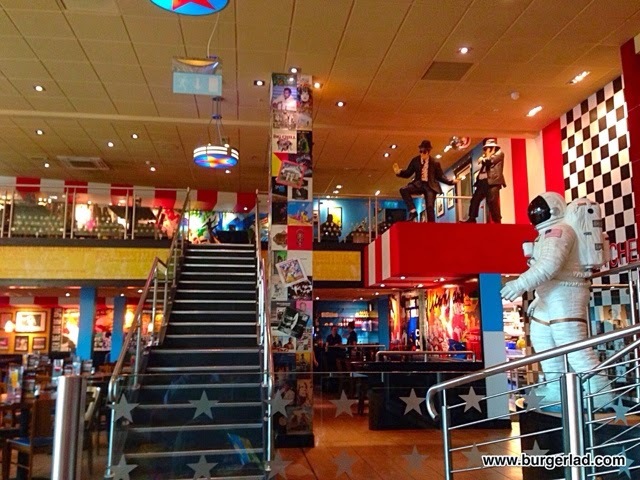 Back to Bruce Lee though, and TGI Fridays are obviously quite proud of him, as his picture occupies a full page beside the burger section of the menu. Looks great, except for the tomato lurking at the bottom. I’ll have to get rid of that. As I’m waiting, I have a look at the extensive drinks menu. Heavy on the cocktails, which are always fun every now and again. I just can’t imagine TGI Fridays being a drinks-only destination, although there is a separate bar area. Anyway, main event and with a Kung Fu flourish, Bruce and his perm arrive on my table. Wow! Presentation has been given a lot of thought here. Service wasn’t exactly lightning fast. It took about 30 minutes from placing the order to it arriving. That’s OK if you’re there for a relaxing lunch, but it’s a bit long when your dining partner is a hungry, impatient 4-year old. It’s a big restaurant, with lots of tables. But it does seem to be amply staffed by an army of smartly dressed youths. Bruce had his top off. It’s very difficult to express smell in words, but Bruce smelled great. I really got a whiff of the colourful chillies and spices. The crispy noodle perm didn’t really stand out as much as it does in the marketing material, but it was definitely there. The fries were tip-top. Hot, crispy, with skin. All the elements of perfect fries present. The seasoning was perhaps a bit over-salty but I don’t find that a problem. Just makes me drink more, and TGI Fridays offer free refills. When I put Bruce’s top back on, I noticed how smooth and shiny he was. That’s a glazed brioche for you. Love it! When I took my first bite, Bruce’s Asian heritage was instantly recognisable. All those spices. 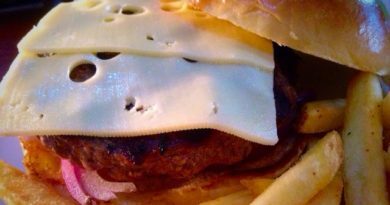 And the crunchy bits on top of the burger added a new and interesting element to the bite. Well thought out. 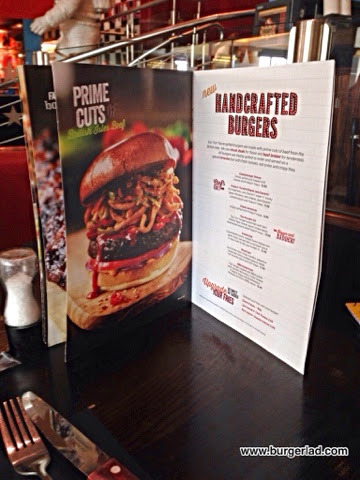 Which Handcrafted Burger would you go for…? There’s a good generous glob of sauce underneath it all, which keeps dribbling out over my thumb. Halfway through, I’m well aware of the spiciness lingering in my mouth. It’s not overpowering. It’s just right. That’s what I love about jalapeños – that clean heaty feel without the fires of hell. I’m not keen on the chillies at the ridiculous end of the scale. Habaneros, Naga and so on. The bun was soft, squidgy, with that yellow tinge that brioche has. It held together very well. Overall, I was very impressed. 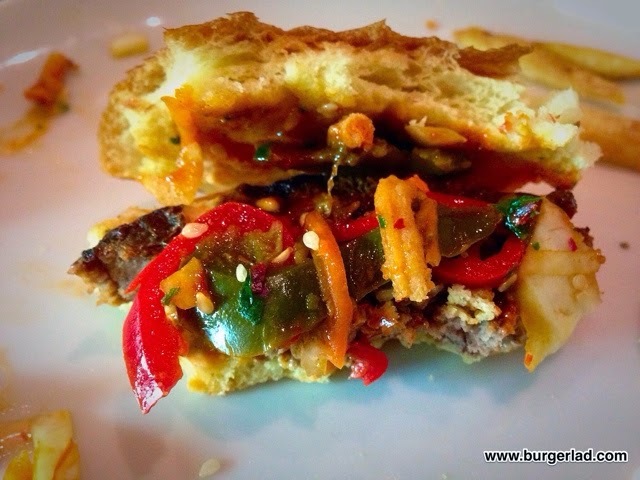 This was a spicy burger no doubt, but at the right end of the Scoville scale. It has a lovely balance of flavours, colours, spices and textures. It looks fantastic and the crunch gives it a pretty unique dimension. I’d definitely like to meet Bruce Lee again, but I’m quite sure my next visit to TGI Fridays will involve the French Dip (wasn’t that the stuff that bumped off the hapless shoe in Who Framed Roger Rabbit?). I had this beast yesterday and it was brilliant but having the raging shits at 4 in the morning took the shine off it.